We both retired in August 2012 and agreed that we would wait a full year before we got involved in anything…………. 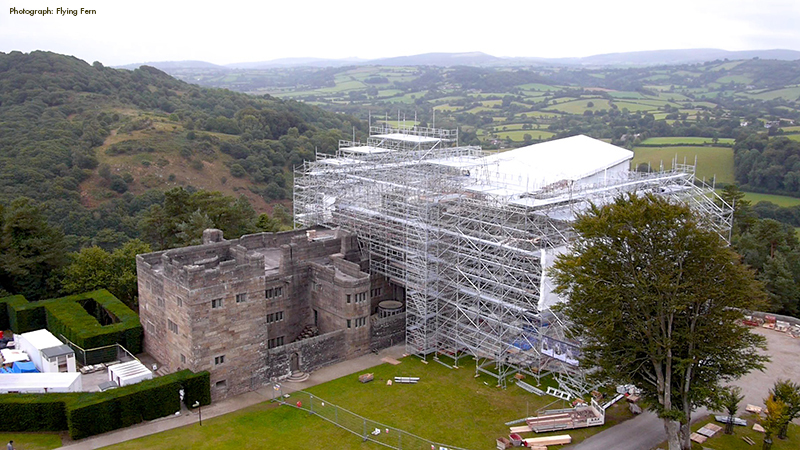 and so six months later we found ourselves volunteers at Castle Drogo! On reflection, it may have been inevitable. I grew up in Plymouth and discovered the Teign Gorge as a child in the 1950’s , when my father eventually got a car (North Dartmoor would have been a long cycle ride from home.) Later in 1960 I was at Scout camp in Whiddon Park and saw the Castle looming high above. Later again as a student, I was studying Lutyens, and made the pilgrimage to look around the Castle the year it opened in 1974, camping at Fingle Bridge. This pilgrimage extended to the Drewe Arms when Mabel Mudge presided over the only little bar on the left of the door. Much much later, downsizing to buy a tiny second home in Chagford in 2004, we found ourselves visiting the Castle regularly when friends and family came to stay. With all those visits we became extremely familiar with Drogo, its architecture, contents and story. And so, earlier this year we came along to find out what it is all about ……and signed up there and then! The phrase ‘press ganged’ never entered our heads! Ali elected for Visitor Reception and I dithered around so became a Room Guide. The team on VR are a ‘jolly crew’ and thus Ali was kindly let into the deep end quite quickly gaining skills in dealing with the cheerful, and the slightly more demanding, visitors. Buggy driving was taught by one of the ‘would be’ Jensen Buttons and it is now a fight to get a go in the driving seat. Fortunately discerning clientele demand a lady driver. One deviation was volunteering for car park duty on Easter Monday, a day when a cruel North West wind brought freezing temperatures to the elevated plateau which rapidly overfilled. I went on the tour guide courses and then shadowed some very experienced guides as back up. Eventually on one tour the kindly guide suggested that I did the second tour in the afternoon. Well, that came as a shock, but with that kind backup I struggled through. Did any of the visitors spot the shaking hand and quaking voice? Since then I have completed a further number of tours, again with kindly back up. We’ve managed just one walk with the Drogo Walkers, it would be more but family and visitors intrude. Our first year is coming towards it’s close. Crikey…………!! On reflection we have enjoyed our first year very very much, the friendliness of all of the staff and volunteers is quite wonderful, and we look forward to more years supporting Castle Drogo and the Trust. If you would like to find out about the latest volunteer opportunities, please contact Laurence Harvey 01647 434114, laurence.harvey@nationaltrust.org.uk.